Albanians are not afraid anymore to talk about their dark history under communism. The young generations here and the rest of the world need to know what happened 25 - 50 years ago in this country. 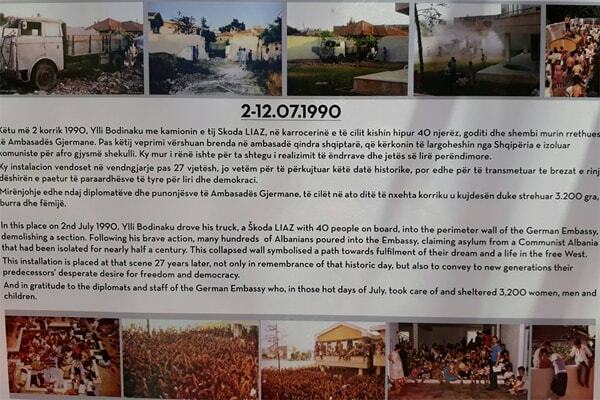 One episode that came to light these days was the storm on Foreign Embassies by more than 3000 Albanians in July 90. That was the first step toward throwing down the communist regime in Albania. 8 months after the fall of Berlin wall, an attempt to break the walls happened also in the isolated Albania. Young people from Tirana were the first to understand the need for change in Albania too and for removing the walls. 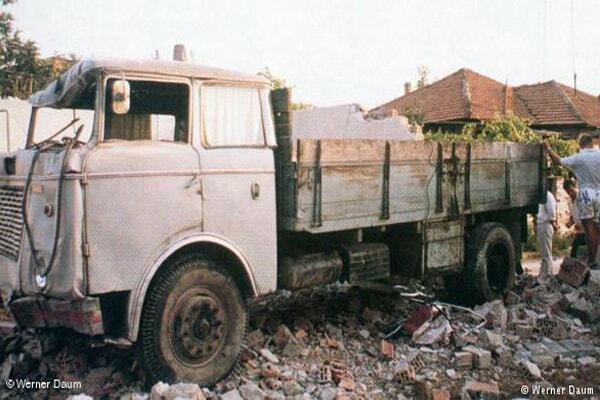 One brave Albanian Ylli Bodinaku, decided to enter in German Embassy with his own truck. With his wife and two children, one of them just two months old, he headed the truck in the back giant wall of German Embassy in 2d of July 1990. The wall was destroyed and even though the stones were scattered everywhere, even inside the car, he managed to enter his family safely inside. His truck created a gate for 36 persons who entered that way in the German Embassy, and more than 3000 others following his example to jump in other embassies in the same area. Former German Foreign Minister Hans Dietrich Genscher, called Mr Bodinaku a hero that time. The regime acted strongly with fortifying the zone around the embassies not letting even the familiars of the people inside to meet each other. The regime named these people vandals, and started propaganda in all the country against these movement. Some parents denied their children in order to be safe in the regime. While the West decided to issue passports to all the people who managed to enter inside. After 10 days, all people entering embassies through crossing walls headed safely to the respective countries. The regime enforced the security in all borders and embassies, but the real revolution started only some months later in December 1990 with the revolt of Students which threw down the Statue of Enver Hoxha in the center of Tirana. Then the democratic changes followed with creation of bipolar party system and the first democratic elections. Mr Ylli Bodinaku has told his story several times for media. But there were no memorial or statue to remember his act until now. On July 3, architects Gjergj Islami and Ana Pekmezi and artist Eljan Tanini unveiled an installation on the wall of the German embassy in Tirana. Three artists invited Ylli Bodinaku to work on this project and to create the truck in the same state it was when he entered the Embassy. 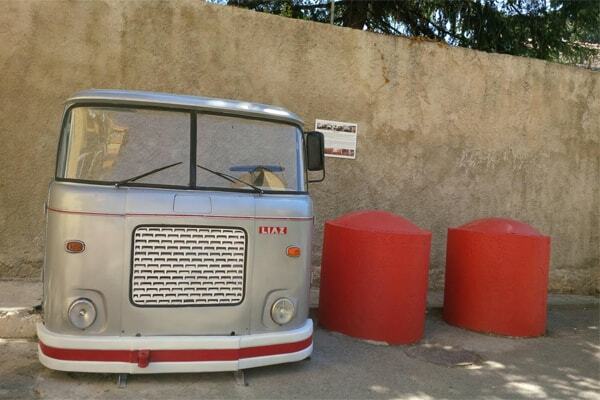 The same Liaz truck, with the same color was put at the same place next to German Embassy. The truck is placed overlooking the street and not the wall as the mission is now accomplished. It serves now only tell the story to the young generation and to look for the future. A placard was placed there to show the story. This is the first part of a big project called The Wall, which is expected to be applied around the walls of Embassies Block, to remind other tragic stories related the same episode. 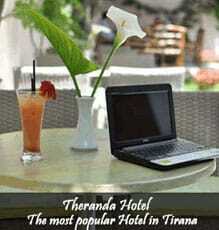 Travellers are invited to visit this place, and to know about that troubled history of Albanians during 90. 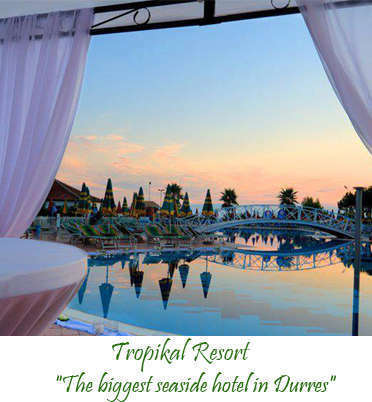 It is now a fact that dark tourism and the unique history of Albania during communist time are attracting foreign tourists more than its modern history. We have still much to tell the world about what happened in Albania, when we were an isolated country.